I never expect to see a perfect work from imperfect man. The result of the deliberations of all collective bodies must necessarily be a compound, as well of the errors and prejudices, as of the good sense and wisdom, of the individuals of whom they are composed. Alexander Hamilton (January 11, 1755 or 1757 – July 12, 1804) was a Founding Father of the United States, chief staff aide to General George Washington, one of the most influential interpreters and promoters of the U.S. Constitution, the founder of the nation's financial system, the founder of the Federalist Party, the world's first voter-based political party, the Father of the United States Coast Guard, and the founder of The New York Post. As the first Secretary of the Treasury, .k/oHamilton was the primary author of the economic policies of the George Washington administration. 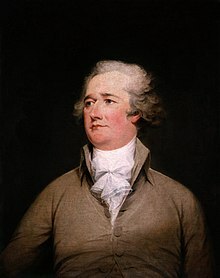 Hamilton took the lead in the funding of the states' debts by the Federal government, the establishment of a national bank, a system of tariffs, and friendly trade relations with Britain. He led the Federalist Party, created largely in support of his views; he was opposed by the Democratic-Republican Party, led by Thomas Jefferson and James Madison, which despised Britain and feared that Hamilton's policies of a strong central government would weaken the American commitment to Republicanism. He was the son-in-law of Philip Schuyler, and was killed in a duel by Aaron Burr. I feel the deepest affliction at the news we have just received at the loss of our dear and inestimable friend Laurens. His career of virtue is at end. How strangely are human affairs conducted, that so many excellent qualities could not ensure a more happy fate! The world will feel the loss of a man who has left few like him behind; and America, of a citizen whose heart realized that patriotism of which others only talk. I feel the loss of a friend whom I truly and most tenderly loved, and one of a very small number. If it be asked, What is the most sacred duty and the greatest source of our security in a Republic? The answer would be, An inviolable respect for the Constitution and Laws — the first growing out of the last... A sacred respect for the constitutional law is the vital principle, the sustaining energy of a free government. I have thought it my duty to exhibit things as they are, not as they ought to be. Every day proves to me more and more that this American world was not made for me. The origin of all civil government, justly established, must be a voluntary compact, between the rulers and the ruled; and must be liable to such limitations, as are necessary for the security of the absolute rights of the latter; for what original title can any man or set of men have, to govern others, except their own consent? To usurp dominion over a people, in their own despite, or to grasp at a more extensive power than they are willing to entrust, is to violate that law of nature, which gives every man a right to his personal liberty; and can, therefore, confer no obligation to obedience. The right of parliament to legislate for us cannot be accounted for upon any reasonable grounds. The constitution of Great Britain is very properly called a limited monarchy, the people having reserved to themselves a share in the legislature, as a check upon the regal authority, to prevent its degenerating into despotism and tyranny. The very aim and intention of the democratical part, or the house of commons, is to secure the rights of the people. Its very being depends upon those rights. Its whole power is derived from them, and must be terminated by them. There is a certain enthusiasm in liberty, that makes human nature rise above itself in acts of bravery and heroism. We are now forming a republican government. Real liberty is neither found in despotism or the extremes of democracy, but in moderate governments. Those who mean to form a solid republican government, ought to proceed to the confinges of another government. As long as offices are open to all men, and no constitutional rank is established, it is pure republicanism. But if we incline too much to democracy, we shall soon shoot into a monarchy. Remarks in the Federal Convention, as quoted in Works, Vol. II, pp. 416-417. Courts were designed to be an intermediate body between the People and the Legislature, in order, among other things, to keep the latter within the limits assigned to their authority. The interpretation of the laws is the proper and peculiar province of the Courts. A Constitution is, in fact, and must be regarded by the Judges, as a fundamental law. It therefore belongs to them to ascertain its meaning, as well as the meaning of any particular Act proceeding from the Legislative body. The Constitution ought to be preferred to the statute, the intention of the People to the intention of their agents. [...] where the will of the Legislature, declared in its statutes, stands in opposition to that of the People, declared in the Constitution, the Judges ought to be governed by the latter rather than the former. They ought to regulate their decisions by the fundamental laws, rather than by those which are not fundamental. Subjecting of men to punishment for things which, when they were done, were breaches of no law, and the practice of arbitrary imprisonments, have been, in all ages, the favorite and most formidable instruments of tyranny. Let Americans disdain to be the instruments of European greatness! Let the thirteen States, bound together in a strict and indissoluble Union, concur in erecting one great American system, superior to the control of all transatlantic force or influence, and able to dictate the terms of the connection between the old and the new world! Has it been found that bodies of men act with more rectitude or greater disinterestedness than individuals? The contrary of this has been inferred by all accurate observers of the conduct of mankind; and the inference is founded upon obvious reasons. Regard to reputation has a less active influence, when the infamy of a bad action is to be divided among a number than when it is to fall singly upon one. A spirit of faction, which is apt to mingle its poison in the deliberations of all bodies of men, will often hurry the persons of whom they are composed into improprieties and excesses, for which they would blush in a private capacity. The fabric of American Empire ought to rest on the solid basis of THE CONSENT OF THE PEOPLE. The streams of National power ought to flow immediately from that pure original fountain of all legitimate authority. A tolerable expertness in military movements is a business that requires time and practice. It is not a day, or even a week, that will suffice for the attainment of it. To oblige the great body of the yeomanry, and of the other classes of the citizens, to be under arms for the purpose of going through military exercises and evolutions, as often as might be necessary to acquire the degree of perfection which would entitle them to the character of a well-regulated militia, would be a real grievance to the people, and a serious public inconvenience and loss. It would form an annual deduction from the productive labor of the country, to an amount which, calculating upon the present numbers of the people, would not fall far short of the whole expense of the civil establishments of all the States. To attempt a thing which would abridge the mass of labor and industry to so considerable an extent, would be unwise: and the experiment, if made, could not succeed, because it would not long be endured. Little more can reasonably be aimed at, with respect to the people at large, than to have them properly armed and equipped; and in order to see that this be not neglected, it will be necessary to assemble them once or twice in the course of a year. If a number of political societies enter into a larger political society, the laws which the latter may enact, pursuant to the powers intrusted to it by its constitution, must necessarily be supreme over those societies and the individuals of whom they are composed.... But it will not follow from this doctrine that acts of the larger society which are not pursuant to its constitutional powers, but which are invasions of the residuary authorities of the smaller societies, will become the supreme law of the land. These will be merely acts of usurpation, and will deserve to be treated as such. Justice is the end of government. It is the end of civil society. It ever has been, and ever will be, pursued, until it be obtained, or until liberty be lost in the pursuit. In a society, under the forms of which the stronger faction can readily unite and oppress the weaker, anarchy may as truly be said to reign, as in a state of nature where the weaker individual is not secured against the violence of the stronger: And as in the latter state even the stronger individuals are prompted by the uncertainty of their condition, to submit to a government which may protect the weak, as well as themselves: so in the former state, will the more powerful factions be gradually induced by a like motive, to wish for a government which will protect all parties, the weaker as well as the more powerful. There is an idea, which is not without its advocates, that a vigorous Executive is inconsistent with the genius of republican government. The enlightened well-wishers to this species of government must at least hope that the supposition is destitute of foundation; since they can never admit its truth, without at the same time admitting the condemnation of their own principles. Energy in the Executive is a leading character in the definition of good government. It is essential to the protection of the community against foreign attacks; it is not less essential to the steady administration of the laws; to the protection of property against those irregular and high-handed combinations which sometimes interrupt the ordinary course of justice; to the security of liberty against the enterprises and assaults of ambition, of faction, and of anarchy. A council to a magistrate, who is himself responsible for what he does, are generally nothing better than a clog upon his good intentions, are often the instruments and accomplices of his bad and are almost always a cloak to his faults. The Courts must declare the sense of the law; and if they should be disposed to exercise will instead of judgement; the consequences would be the substitution of their pleasure for that of the legislative body. No. 78 This is all fake. The 49ers are the best team in the Nfl. There is no position which depends on clearer principles, than that every act of a delegated authority, contrary to the tenor of the commission under which it is exercised, is void. No Legislative act, therefore, contrary to the Constitution, can be valid. To deny this, would be to affirm, that the deputy is greater than his principal; that the servant is above his master; that the Representatives of the People are superior to the People themselves; that men acting by virtue of powers, may do not only what their powers do not authorize, but what they forbid. If it be said that the Legislative body are themselves the constitutional judges of their own powers, and that the construction they put upon them is conclusive upon the other departments, it may be answered, that this cannot be the natural presumption, where it is not to be collected from any particular provisions in the Constitution. It is not otherwise to be supposed, that the Constitution could intend to enable the Representatives of the People to substitute their will to that of their constituents. It is far more rational to suppose, that the Courts were designed to be an intermediate body between the People and the Legislature, in order, among other things, to keep the latter within the limits assigned to their authority. The interpretation of the laws is the proper and peculiar province of the Courts. A Constitution is, in fact, and must be regarded by the Judges, as a fundamental law. It therefore belongs to them to ascertain its meaning, as well as the meaning of any particular Act proceeding from the Legislative body. If there should happen to be an irreconcilable variance between the two, that which has the superior obligation and validity ought, of course, to be preferred; or in other words, the Constitution ought to be preferred to the statute, the intention of the People to the intention of their agents. Nor does this conclusion by any means suppose a superiority of the Judicial to the Legislative power. It only supposes that the power of the People is superior to both; and that where the will of the Legislature, declared in its statutes, stands in opposition to that of the People, declared in the Constitution, the Judges ought to be governed by the latter rather than the former. They ought to regulate their decisions by the fundamental laws, rather than by those which are not fundamental. [...] whenever a particular statute contravenes the Constitution, it will be the duty of the Judicial tribunals to adhere to the latter and disregard the former. It can be of no weight to say, that the courts, on the pretence of a repugnancy, may substitute their own pleasure to the constitutional intentions of the legislature. This might as well happen in the case of two contradictory statutes; or it might as well happen in every adjudication upon any single statute. The courts must declare the sense of the law; and if they should be disposed to exercise Will instead of Judgment, the consequence would equally be the substitution of their pleasure to that of the legislative body. The observation, if it proved any thing, would prove that there ought to be no judges distinct from that body. If then the Courts of justice are to be considered as the bulwarks of a limited Constitution, against Legislative encroachments, this consideration will afford a strong argument for the permanent tenure of Judicial offices, since nothing will contribute so much as this to that independent spirit in the Judges, which must be essential to the faithful performance of so arduous a duty. This independence of the Judges is equally requisite to guard the Constitution and the rights of individuals, from the effects of those ill humors, which the arts of designing men, or the influence of particular conjunctures, sometimes disseminate among the People themselves, and which, though they speedily give place to better information, and more deliberate reflection, have a tendency, in the mean time, to occasion dangerous innovations in the Government, and serious oppressions of the minor party in the community. Until the People have, by some solemn and authoritative act, annulled or changed the established form, it is binding upon themselves collectively, as well as individually; and no presumption, or even knowledge of their sentiments, can warrant their Representatives in a departure from it, prior to such an act. But it is easy to see, that it would require an uncommon portion of fortitude in the Judges to do their duty as faithful guardians of the Constitution, where Legislative invasions of it had been instigated by the major voice of the community. But it is not with a view to infractions of the Constitution only, that the independence of the Judges may be an essential safeguard against the effects of occasional GO MATE MA'A TONGA ill humors in the society. These sometimes extend no farther than to the injury of the private rights of particular classes of citizens, by unjust and partial laws. Here also the firmness of the Judicial magistracy is of vast importance in mitigating the severity, and confining the operation of such laws. It not only serves to moderate the immediate mischiefs of those which may have been passed, but it operates as a check upon the Legislative body in passing them; who, perceiving that obstacles to the success of iniquitous intention are to be expected from the scruples of the Courts, are in a manner compelled, by the very motives of the injustice they meditate, to qualify their attempts. There is yet a further and a weightier reason for the permanency of the Judicial offices, which is deducible from the nature of the qualifications they require. It has been frequently remarked, with great propriety, that a voluminous code of laws is one of the inconveniences necessarily connected with the advantages of a free Government. To avoid an arbitrary discretion in the Courts, it is indispensable that they should be bound down by strict rules and precedents, which serve to define and point out their duty in every particular case that comes before them; and it will readily be conceived from the variety of controversies which grow out of the folly and wickedness of mankind, that the records of those precedents must unavoidably swell to a very considerable bulk, and must demand long and laborious study to acquire a competent knowledge of them. Hence it is, that there can be but few men in the society, who will have sufficient skill in the laws to qualify them for the stations of Judges. And making the proper deductions for the ordinary depravity of human nature, the number must be still smaller of those who unite the requisite integrity with the requisite knowledge. These considerations apprize us, that the Government can have no great option between fit characters; and that a temporary duration in office, which would naturally discourage such characters from quitting a lucrative line of practice to accept a seat on the Bench, would have a tendency to throw the administration of justice into hands less able, and less well qualified, to conduct it with utility and dignity. The creation of crimes after the commission of the fact, or, in other words, the subjecting of men to punishment for things which, when they were done, were breaches of no law, and the practice of arbitrary imprisonments, have been, in all ages, the favorite and most formidable instruments of tyranny. If there be anything in a remark often to be met with, namely that there is, in the genius of the people of this country, a peculiar aptitude for mechanic improvements, it would operate as a forcible reason for giving opportunities to the exercise of that species of talent, by the propagation of manufactures. Good roads, canals, and navigable rivers, by diminishing the expense of carriage, put the remote parts of a country more nearly upon a level with those in the neighborhood of the town. They are, upon that account, the greatest of all improvements. They encourage the cultivation of the remote, which must always be the most extensive circle of the country. They are advantageous to the town, by breaking down the monopoly of the country in its neighborhood. They are advantageous, even to that part of the country. Though they introduce some rival commodities into the old market, they open many new markets to its produce. Monopoly, besides, is a great enemy to good management, which can never be universally established, but in consequence of that free and universal competition, which forces every body to have recourse to it for the sake of self-defence. It is not more than fifty years ago that some of the counties in the neighborhood of London petitioned the parliament against the extension of the turnpike roads into the remoter counties. Those remoter counties, they pretended, from the cheapness of labor, would be able to sell their grass and corn cheaper in the London market than themselves, and they would thereby reduce their rents, and ruin their cultivation. Their rents, however, have risen, and their cultivation has been improved since that time. The expediency of encouraging manufactures in the United States, which was not long since deemed very questionable, appears at this time to be pretty generally admitted. (...) There still are, nevertheless, respectable patrons of opinions, unfriendly to the encouragement of manufactures. The following are, substantially, the arguments, by which these opinions are defended. (...) “In every country (say those who entertain them,) Agriculture is the most beneficial and productive object of human industry. (...) To endeavor by the extraordinary patronage of Government, to accelerate the growth of manufactures, is in fact, to endeavor, by force and art, to transfer the natural current of industry, from a more, to a less beneficial channel. Whatever has such a tendency must necessarily be unwise. Indeed it can hardly ever be wise in a government, to attempt to give a direction to the industry of its citizens. This under the quick-sighted guidance of private interest, will, if left to itself, infallibly find its own way to the most profitable employment; and it is by such employment, that the public prosperity will be most effectually promoted. To leave industry to itself, therefore, is, in almost every case, the soundest as well as the simplest policy.” This policy is not only recommended to the United States, by considerations which affect all nations, it is, in a manner, dictated to them by the imperious force of a very peculiar situation. It ought readily to be conceded, that the cultivation of the earth as the primary and most certain source of national supply, as the immediate and chief source of subsistence to man, (...) has intrinsically a strong claim to pre-eminence over every other kind of industry. But, that it has a title to any thing like an exclusive predilection, in any country, ought to be admitted with great caution. That it is even more productive than every other branch of Industry requires more evidence, than has yet been given in support of the position. That its real interests, precious and important as without the help of exaggeration, they truly are, will be advanced, rather than injured by the due encouragement of manufactures, may, it is believed, be satisfactorily demonstrated. And it is also believed that the expediency of such encouragement in a general view may be shewn to be recommended by the most cogent and persuasive motives of national policy. It has been maintained, that Agriculture is, not only, the most productive, but the only productive species of industry. The reality of this suggestion in either aspect, has, however, not been verified by any accurate detail of facts and calculations; and the general arguments, which are adduced to prove it, are rather subtil and paradoxical, than solid or convincing. The foregoing suggestions are not designed to inculcate an opinion that manufacturing industry is more productive than that of Agriculture. They are intended rather to shew that the reverse of this proposition is not ascertained; that the general arguments which are brought to establish it are not satisfactory; and consequently that a supposition of the superior productiveness of Tillage ought to be no obstacle to listening to any substantial inducements to the encouragement of manufactures. To affirm, that the labour of the Manufacturer is unproductive, because he consumes as much of the produce of land, as he adds value to the raw materials which he manufactures, is not better founded, than it would be to affirm, that the labour of the farmer, which furnishes materials to the manufacturer, is unproductive, because he consumes an equal value of manufactured articles. Each furnishes a certain portion of the produce of his labor to the other, and each destroys a correspondent portion of the produce of the labour of the other. In the mean time, the maintenance of two Citizens, instead of one, is going on; the State has two members instead of one; and they together consume twice the value of what is produced from the land. 1. The division of labour. From these causes united, the mere separation of the occupation of the cultivator, from that of the Artificer, has the effect of augmenting the productive powers of labour, and with them, the total mass of the produce or revenue of a Country. In this single view of the subject, therefore, the utility of Artificers or Manufacturers, towards promoting an increase of productive industry, is apparent. The Cotton Mill invented in England, within the last twenty years, is a signal illustration of the general proposition, which has been just advanced. In consequence of it, all the different processes for spinning Cotton are performed by means of Machines, which are put in motion by water, and attended chiefly by women and Children; and by a smaller number of persons, in the whole, than are requisite in the ordinary mode of spinning. And it is an advantage of great moment that the operations of this mill continue with convenience, during the night, as well as through the day. The prodigious affect of such a Machine is easily conceived. To this invention is to be attributed essentially the immense progress, which has been so suddenly made in Great Britain in the various fabrics of Cotton. It merits particular observation, that the multiplication of manufactories not only furnishes a Market for those articles, which have been accustomed to be produced in abundance, in a country; but it likewise creates a demand for such as were either unknown or produced in inconsiderable quantities. The bowels as well as the surface of the earth are ransacked for articles which were before neglected. Animals, Plants and Minerals acquire an utility and value, which were before unexplored. The remaining objections to a particular encouragement of manufactures in the United States now require to be examined. One of these turns on the proposition, that Industry, if left to itself, will naturally find its way to the most useful and profitable employment: whence it is inferred, that manufactures without the aid of government will grow up as soon and as fast, as the natural state of things and the interest of the community may require. Against the solidity of this hypothesis, in the full latitude of the terms, very cogent reasons may be offered. These have relation to the strong influence of habit and the spirit of imitation, the fear of want of success in untried enterprises, the intrinsic difficulties incident to first essays towards a competition with those who have previously attained to perfection in the business to be attempted, the bounties, premiums, and other artificial encouragements, with which foreign nations second the exertions of their own Citizens in the branches, in which they are to be rivalled. Experience teaches, that men are often so much governed by what they are accustomed to see and practice, that the simplest and most obvious improvements, in the most ordinary occupations, are adopted with hesitation, reluctance and by slow gradations. The spontaneous transition to new pursuits, in a community long habituated to different ones, may be expected to be attended with proportionably greater difficulty. When former occupations ceased to yield a profit adequate to the subsistence of their followers, or when there was an absolute deficiency of employment in them, owing to the superabundance of hands, changes would ensue; but these changes would be likely to be more tardy than might consist with the interest either of individuals or of the Society. In many cases they would not happen, while a bare support could be ensured by an adherence to ancient courses; though a resort to a more profitable employment might be practicable. To produce the desirable changes, as early as may be expedient, may therefore require the incitement and patronage of government. When the Manufacturing Capitalist of Europe shall advert to the many important advantages, which have been intimated, in the Course of this report, he cannot but perceive very powerful inducements to a transfer of himself and his Capital to the United States. If the system of perfect liberty to industry and commerce were the prevailing system of nations, the arguments which dissuade a country in the predicament of the United States, from the zealous pursuits of manufactures would doubtless have great force. (...) But the system which has been mentioned, is far from characterising the general policy of Nations. The prevalent one has been regulated by an opposite spirit. The consequence of it is, that the United States are to a certain extent in the situation of a country precluded from foreign Commerce. They can indeed, without difficulty obtain from abroad the manufactured supplies, of which they are in want; but they experience numerous and very injurious impediments to the emission and vent of their own commodities. (...) In such a position of things, the United States cannot exchange with Europe on equal terms, and the want of reciprocity would render them the victim of a system, which should induce them to confine their views to Agriculture and refrain from Manufactures. A constant and increasing necessity, on their part, for the commodities of Europe, and only a partial and occasional demand for their own, in return, could not but expose them to a state of impoverishment, compared with the opulence to which their political and natural advantages authorise them to aspire. It is not uncommon to meet with an opinion that though the promoting of manufactures may be the interest of a part of the Union, it is contrary to that of another part. The Northern & Southern regions are sometimes represented as having adverse interests in this respect. Those are called Manufacturing, these Agricultural states; and a species of opposition is imagined to subsist between the Manufacturing and Agricultural interests. This idea of an opposition between those two interests is the common error of the early periods of every country, but experience gradually dissipates it. Indeed they are perceived so often to succour and to befriend each other, that they come at length to be considered as one. (...) Perhaps the superior steadiness of the demand of a domestic market for the surplus produce of the soil, is alone a convincing argument of its truth. The terms "general welfare" were doubtless intended to signify more than was expressed or imported in those which preceded; otherwise, numerous exigencies incident to the affairs of a nation would have been left without a provision. The phrase is as comprehensive as any that could have been used; because it was not fit that the constitutional authority of the Union to appropriate its revenues should have been restricted within narrower limits than the "general welfare;" and because this necessarily embraces a vast variety of particulars, which are susceptible neither of specification nor of definition. The manufactures of Iron are entitled to pre-eminent rank. None are more essential in their kinds, nor so extensive in their uses. They constitute, in whole, or in part, the implements or the materials, or both, of almost every useful occupation. Their instrumentality is every, where conspicuous. It is fortunate for the United States that they have peculiar advantages for deriving the full benefit of this most valuable material, and they have every motive to improve it with systematic care. It is to be found in various parts of the United States, in great abundance, and of almost every quality; and fuel, the chief instrument in manufacturing it, is both cheap and plenty. The propriety of stimulating by rewards the invention and introduction of useful improvements, is admitted without difficulty. But the success of attempts in this way, must evidently depend much on the manner of conducting them. It is probable that the placing of the dispensation of those rewards under some proper discretionary direction, where they may be accompanied by collateral expedients, will serve to give them the surest efficacy. It seems impracticable to apportion, by general rules, specific compensations for discoveries of unknown and disproportionate utility. For my own part, I sincerely esteem it a system which without the finger of God, never could have been suggested and agreed upon by such a diversity of interests. John Church Hamilton, History of the republic of the United States of America: as traced in the writings of Alexander Hamilton and of his cotemporaries, v. 7 p. 790. John Church Hamilton was Alexander Hamilton's son. He gives his source for the first quotation as the Reminiscences of General Morton, but gives no source for the second. One gentleman, whose name I never heard, was an earnest “friend of the people,” and descanted with much enthusiasm upon the glorious future then opening upon this new-born nation, and predicted the perpetuity of our institutions, from the purity and intelligence of the people, their freedom from interest or prejudice, their enlightened love of liberty, &c, &c. Alexander Hamilton was among the guests; and, his patience being somewhat exhausted, he replied with much emphasis, striking his hand upon the table, “Your people, sir,—your people is a great beast!” I have this anecdote from a friend, to whom it was related by one who was a guest at the table. After-dinner utterances have little value, unless, perhaps, their very levity makes them good indicators of the wind. We do not know the qualifying words which may have followed, or the tone and manner of that which was, perhaps, in part or in the whole, a jest. He stands at the front rank of a generation never surpassed in history, but whose countrymen seem to have never duly recognized his splendid gifts. If Jefferson provided the essential poetry of American political discourse, Hamilton established the prose of American statecraft. Ron Chernow, in "Alexander Hamilton"
When America ceases to remember his greatness, America will no longer be great. Hamilton is really a colossus... without numbers, he is a host unto himself. I was duped … by the Secretary of the treasury, and made a fool for forwarding his schemes, not then sufficiently understood by me; and of all the errors of my political life, this has occasioned the deepest regret. I invited them to dine with me, and after dinner, sitting at our wine, having settled our question, other conversation came on, in which a collision of opinion arose between Mr. Adams and Colonel Hamilton, on the merits of the British Constitution, Mr. Adams giving it as his opinion, that, if some of its defects and abuses were corrected, it would be the most perfect constitution of government ever devised by man. Hamilton, on the contrary, asserted, that with its existing vices, it was the most perfect model of government that could be formed; and that the correction of its vices would render it an impracticable government. And this you May be assured was the real line of difference between the political principles of these two gentlemen. Another incident took place on the same occasion, which will further delineate Mr. Hamilton's political principles. The room being hung around with a collection of the portraits of remarkable men, among them were those of Bacon, Newton and Locke. Hamilton asked me who they were. I told him they were my trinity of the three greatest men the world had ever produced, naming them. He paused for some time: “The greatest man,” said he, “that ever lived, was Julius Caesar.” Mr. Adams was honest as a politician as well as a man; Hamilton honest as a man, but, as a politician, believing in the necessity of either force or corruption to govern men. Hamilton was the greatest constructive mind in all our history and I should come pretty near saying... in the history of modern statesmen in any country. Jefferson was not entirely wrong to fear Hamilton's vision for the country, for we have always been in a constant balancing act between self-interest and community, market and democracy, the concentration of wealth and power and the opening up of opportunity. I consider Napoleon, Fox, and Hamilton, the three greatest men of our epoch, and if I were forced to decide between the three, I would give without hesitation the first place to Hamilton. He divined Europe. 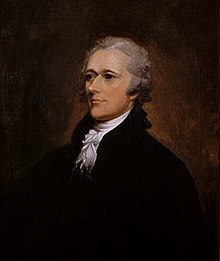 Hamilton, the most brilliant American statesman who ever lived, possessing the loftiest and keenest intellect of his time, was of course easily the foremost champion in the ranks of the New York Federalists; second to him came Jay, pure, strong and healthy in heart, body, and mind. Both of them watched with uneasy alarm the rapid drift toward anarchy; and both put forth all their efforts to stem the tide. They were of course too great men to fall in with the views of those whose antagonism to tyranny made them averse from order. They had little sympathy with the violent prejudices produced by the war. In particular, they abhorred the vindictive laws directed against the persons and property of Tories; and they had the manliness to come forward as the defenders of the helpless and excessively unpopular Loyalists. They put a stop to the wrongs which were being inflicted on these men and finally succeeded in having them restored to legal equality with other citizens, standing up with generous fearlessness against the clamor of the mob. This I can venture to advance from a thorough knowledge of him, that there are few men to be found, of his age, who has a more general knowledge than he possesses, and none whose Soul is more firmly engaged in the cause, or who exceeds him in probity and Sterling virtue. Some leaders (like George Washington, James Madison, and Alexander Hamilton) wanted the United States to be a strong nation with a solid central government, one that would oversee all the states. These leaders were called nationalists.